The film is written by Adrian Hodges and is based on the memoirs of Colin Clark. 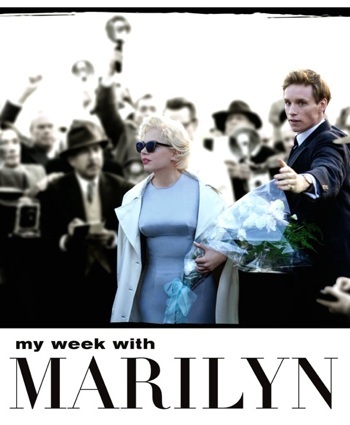 Scenario: Colin Clark (Eddie Redmayne) a 3rd assistant director on the film, “The Prince and the Showgirl” spends the summer in 1956 in England with Marilyn Monroe (Michelle Williams) while they are both working on the film. The film, being a memoir, is the retelling of what happened through the eyes of Colin Clark during that summer. At the time, Monroe was married to playwright Arthur Miller but during the week that he leaves, Monroe depends on Clark for personal comfort. The success of this film depends on who is cast to play Marilyn Monroe and Michelle Williams is amazing. She rose to the enormous challenge of portraying the iconic beauty Marilyn Monroe, capturing both her physical nuances as well as her distinctive personality attributes such as her sultriness, playfulness and sadness. She gave me chills as she perfected many of Monroe’s characteristics. Her playful personality and her dark flip side (her depressions) were spot-on. Also notable is Kenneth Branagh whose character adds humor to the film. He’s also very good in his role and could be nominated for Best Supporting Actor. As the lovesick, much younger Clark, Redmayne is fine in the role, but the chemistry between them is just so-so. The film lacks structure and is slow. Director Simon Curtis was in Chicago and I did have a chance to meet him. He told me that filming took place in the exact same location that was used to shoot “The Prince and the Show Girl” in 1956.
Notable Script Lines: “That’s the first time I’ve ever kissed anyone younger than me.” “I want to be the best actress I can be.” Both lines are by Monroe. See it, if you have any interest in Marilyn Monroe. The film showcases the acting ability of Monroe (as well as Williams) and both of their talents as an entertainers.